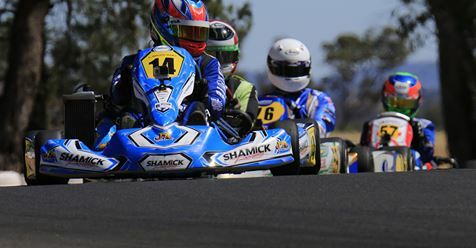 The 2019 Sparco Rotax Pro Tour keeps tradition alive, holding the opening round of the series this Australia Day long weekend (January 26/27) at the Go Kart Club of Victoria’s Todd Road Circuit. The event is the first on the Australian racing calendar and a great way to kick start the season. Held at the iconic Melbourne based track which boasts views of the city skyline and a track that continues to host the most talented drivers from across the country. All drivers will be wanting to showcase their talents and earn a spot in Team Australia to represent their country at the 2019 Rotax Max Challenge Grand Finals in Sarno, Italy. The youngest group of racers aged between 7 and 9 years of age compete in the Micro Max category. Micro Max is proudly brought to you this year by Manson’s TCLM Limited of New Zealand. Amongst our youngest racers are the Z Corse “Burns Twins”, Jenson and Jaxson who will certainly be two to watch throughout the series. Returning alongside the brothers is young gun James Anagnostiadis out of the Tom Williamson Motorsport Team. James joined the class late in the 2018 season but quickly found pace and his way to the front with podium finishes to end the year . New Zealander Marco Manson is joining the fight along with other Rotax debutants, Samuel March of Victoria, Toby Musico and Isaac McNeill of Queensland. The Mini Max field will be shaken up this year with front runners from 2018 moving to Junior Max and Micro Max successors making the next step in their racing careers. 2018 Series Champion, Costa Toparis will arrive as series favourite but will have to watch out for the likes of, Krisitian Janev, Aiva Anagnostiadis, Jake Rutkowski and Max Walton who will all be chasing down the second generation Goulburn racer for the one and only ticket to the 2019 Rotax Max Challenge Grand Final (RMCGF) in Sarno, Italy later in the year. We thank AWC Motorsport Academy who will be this year’s sponsor of the Mini Max Category. Some of the series closest most exhilarating racing comes from our Junior Max drivers and this year 2018 World Final goer William Seal is looking to go one better and wrap up the series in the last of the junior categories. Seal will have to defend Victorian Hugh Barter, fellow TWM team mate Beau Pronesti along with Racehaus Pilot Jarrod Hughes. Adding to the list of drivers this year are Sydney-siders Macey Cluderay & Lewis Buhagiar. Another newcomer from New Zealand is Clay Osbourne who is set to mix it with the Australian field and fly the flag for the Kiwi’s. Ethan Feather of Queensland showed pace in Mini Max and will be looking to be a front runner throughout the 2019 Championship. Junior Max is this year brought to us by Electro Industries from Queensland. Rotax Light and it’s the year of comebacks, Multiple Australian Champion and World Champion, Cody Gillis is making his return to Rotax Racing but he will have to keep his eye on Pierce Lehane, another multiple Australian Champion and European Champion. Mixing it up with the two world class drivers will be Kiwi, Michael McCulloch driving also under the Racehaus Banner, front runner Reece Cohen will again be aboard his JC Kart and back for redemption. World Final attendee Ben Jurczak is back to earn his second ticket to the RMCGF but will have the likes of Leigh Nicolaou looking to take the crown. Australian Champion and Runner-up at the 2018 World Finals is TWM Driver Jaiden Pope who is making his debut to seniors at the Australia Day Opener. DPE Kart Superstores are the sponsor for the Rotax Light Category across the 2019 Series. Rotax Heavy has CRG on board as the sponsor for the year. 2018 Series Winner and CRG Pilot is Queenslander Lane Moore who is back to defend his title in the hotly contested category. He will have to defend off DR Kart Owner, Chris Board and Novacastrian Zac Van Leeuwestyn. Pro Karting Driver Lukas Janev is also returning and looking for podiums throughout the year. New South Welshman Tony Bregonje will be one to watch, making his return to the class as is TWM Driver Ben McMellan. All drivers are vying for the top spot at the conclusion of the series as there is a Rotax 125 Max Engine up for the taking, second place will be awarded a Lucky Design Helmet from IKD and third a $1000 IKD Gift Voucher. In DD2 Masters V8 Ute Champion Kris Walton is back and looking to claim the Series and a ticket to the Rotax Max Challenge Grand Final, however will have fellow Queenslander Scott Howard to defend off and previous World Champion Troy Woolston who will be dominant at his home track. World Final attendees, Trevor Whitby, Terry Hanly & Ash Seward will be putting their World Stage experience to practice at the opening round but will have to keep an eye on Paul Rodgers who has moved from Rotax Heavy to the over 32, gearbox category for the 2019 Season. Tillett is the brand behind DD2 Masters for the six rounds of the Sparco Rotax Pro Tour. DD2 is stacked with newcomers this year, including Elly Morrow & Jonathon Marcusson. Two drivers to watch will be Troy Morrissey from Racehaus and Cody Brewczynski of Velocity Kart Shop/Top Gun Driver Academy who both contested the final round of the 2018 Series in DD2 with success. Brewczynski took out both the South Australian State Championship and the coveted Jason Richards Cup on his debut and will be battling it out with front runners across the weekend and the series. DD2 is this year brought to us by Lucky Design. We are extremely grateful of the support of our sponsors for the year, especially the naming right sponsor for the 2019 Series, Sparco. Sparco have come on board as the naming right sponsor for the live streaming which will be conducted at all six events of 2019. The Sparco Rotax Pro Tour will be live streaming all of Sundays on track action and presentation LIVE from the circuit to our Facebook Page for viewers across the World to keep up with Rotax Racing in Australia. 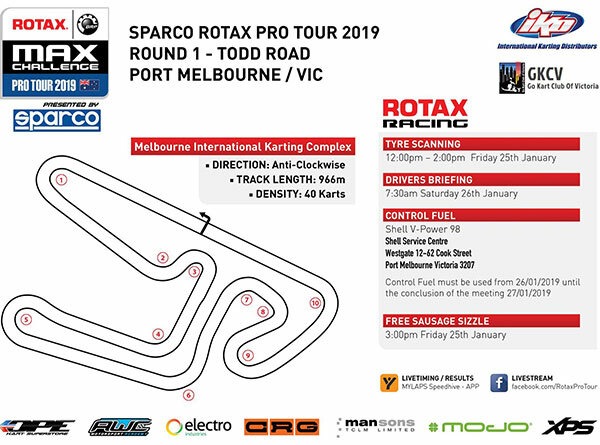 The first round of the 2019 Sparco Rotax Pro Tour will be held at the Go Kart Club of Victoria’s Todd Road Circuit. Entry to the public is free and we encourage spectators to come and join the action on Saturday & Sunday. For more information visit: www.rotax.com.au or Rotax Pro Tour on Facebook, Instagram & Twitter.